The following table ranks schools based on Median VCE Score and percentage of scores of 40 and over in 2018. 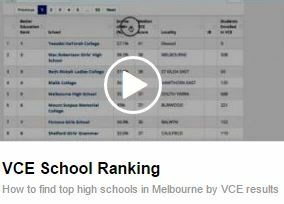 The same ranking by school types: VCE Public School Ranking | VCE Independent School Ranking | VCE Catholic School Ranking. Find best high schools in Melbourne or top schools in Victoria here. You can also find / compare the results and rankings or trends over the years of an individual school or up to 5 schools side-by-side at Compare VCE results/rankings/trends. More information: List of schools sorted by the percentage of the number of entries of VCE high achievers | List of schools sorted by the percentage or the number of high scorers by subjects | Perfect subject scorers and schools | Top achievers by first name and/or last name | VCE school performance by school name. For other types of ranking or the results of other years, please visit School Ranking Home. There are a large range of factors that impact on academic results in addition to the role played by the school itself. These include the SES (Socio Economic Status) background of students, whether the school is selective in its student intake, etc. It is for the reader to do his own research and draw his or her own conclusions. Read more. The small schools with less than 20 study scores are not listed. Check the stats for five school categories - independent, catholic, public, selective and all schools by visiting the mean and median percent of scores of 40 and over. Search VCE studies and schools | ATAR calculator | ATAR Cutoffs | Uni. Course Ranking | Uni. World Ranking. Info! Find VCE results and school rankings together with secondary school ratings of Victoria / Melbourne's best schools on the same feature map. Also check the heat map of the top 20% secondary schools in Victoria.